Steven (Chicagoland, United States) on 8 November 2013 in Plant & Nature and Portfolio. 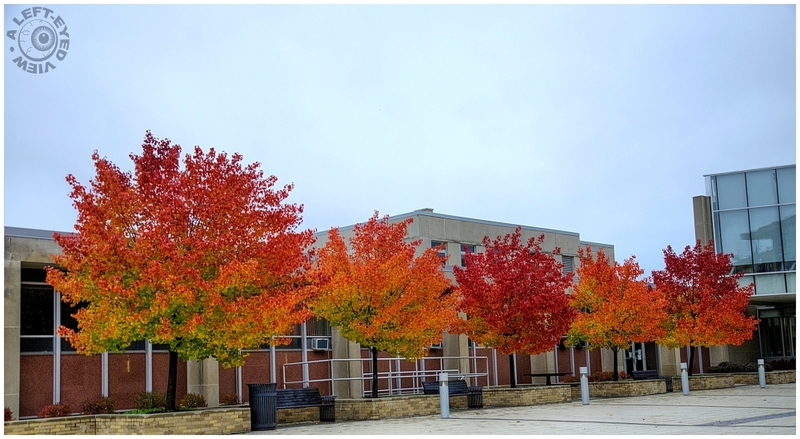 Bradford pear trees spotted outside Waukegan City Hall. These colors have never been seen before since these trees were planted almost eight years ago. This is one of the benefits of landscape design when you can see your choice of tree show its beauty in all seasons. Surprisingly, these trees have retained much of their foliage through windy rain storms during the last week. Here is a close-up of one of those same Bradford pear trees photographed in Spring of 2011. Normally you wouldn't think of trees as part of the design elements of a bilding or development. Architects are getting just a little bit more closer to their communities these days. Splendides couleurs automnales dans un magnifique décor!!! Bonne journée. A wonderful capture with marvelous autumn colours ! They are indeed amazing and very special trees ! Trees in fire ! like them ! Gorgeous - Bradford Pears really do put on quite a show in autumn if conditions are right. I don't think I've ever seen the ones around here go so orange though - they seem to turn more of a deep red. Beautiful fall color in these trees. Beautiful colours in the trees, I like the contrast with the subtle colour of the sky. Beautiful image of these wonderful trees dressed in their fall splendor! Their spring blossoms were gorgeous too. Today you're like me captured the beauty of autumn colors! Nice compo! They are truly beautiful with their varied hues. Sweet shot ! Spectacular colors! A pleasure to look at. Wonderful image. incredible colours! what a great idea to plant these trees this way !!! Those are lovely colors. It's good that they can resist the winds you get. Beautiful autumn colors; the bradford pear trees in our area have just started to turn color; they usually hold there leaves till Thanksgiving. This is a really beautiful capture! They're certainly an excellent addition to the location. You are a bit ahead of us, as ours have not turned yet. Lovely. That is gorgeous. That building would look somewhat mundane without that colour there. They are just showing off for the tourist ... you know how trees are. They look almost unreal ... These autumn colors are really fascinating and they stand out beautifully against the pale colors of the buildings !! !